Background: Although fatty acid composition in serum and desaturase activity, which alters serum fatty acid composition, has been associated with C-reactive protein (CRP) concentration in Western populations, no study has been carried out in non-Western populations. 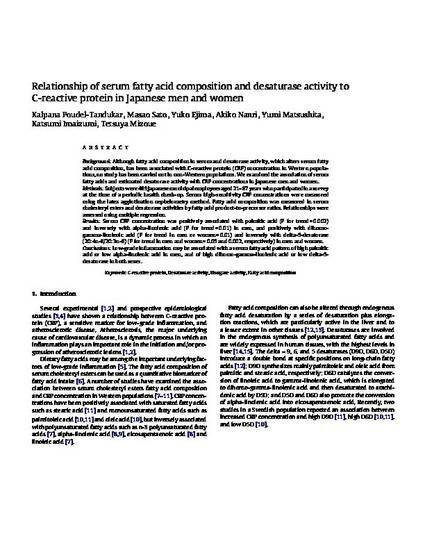 We examined the association of serum fatty acids and estimated desaturase activity with CRP concentrations in Japanese men and women. Methods: Subjects were 489 Japanese municipal employees aged 21–67 yearswhoparticipated in a survey at the time of a periodic health check-up. Serum high-sensitivity CRP concentrations were measured using the latex agglutination nephelometry method. Fatty acid composition was measured in serum cholesteryl esters and desaturase activities by fatty acid product-to-precursor ratios. Relationships were assessed using multiple regression. linolenic acid (P for trend in men or women= 0.01) and inversely with delta-5-desaturase (20:4n-6/20:3n-6) (P for trend in men and women= 0.05 and 0.002, respectively) in men and women.